Littlest Brown Pelican Is 2018 Bird of the Year! We are proud to announce our 2018 Bird of the Year: The Littlest Brown Pelican! With many strong candidates, the race remained close right up to the end, but our little Brown Pelican captured the hearts of many and garnered the most votes. Her story began when she was rescued out of a backyard pond where she had been found, starving, and trying to feed on koi fish. This little Brown was one of more than 50 hungry Brown Pelicans to come into care at our L.A. wildlife center during the month of May. What set this patient apart from the others was her small size. Initially weighing in at just under 2500 grams, this tiny pelican quickly became a staff and volunteer favorite, and much care and attention was given to get her feeding on her own. Once she started gaining weight and thermoregulating, we moved her to our large pelican aviary to give her space to stretch her wings and exercise. While there, she spent most of her time at the side of a very large American White Pelican. The two were an odd, but very cute pair. On June 13th, 2018 this little Brown Pelican returned to her natural home in the wild – an event that was shared with viewers across California on local news stations. She was given a blue band with the numbers N00 at release, so keep an eye out for this little pelican and report any sightings of her or our other blue banded pelicans on our website. This Little Brown Pelican is a beautiful representative of the difference Bird Rescue can make by being ready to respond to any crisis. Whether it’s a surge of starving birds, a botulism outbreak, or an oil spill, Bird Rescue is here to take action to rescue waterbirds in need. We look forward to continuing to take action for birds in 2019. If you would like to help us stand at the ready to rescue waterbirds in crisis, consider donating today! Bird of the Year 2018 – Voting Now Open! As another eventful year at International Bird Rescue comes to a close, the time has come to reflect on our experiences and accomplishments and select our 2018 Bird of the Year. Each bird that comes through our doors gives us the opportunity to take action, help a creature in need, and oft times learn something new about nature and about ourselves. The six candidates below are patients that were representative of significant events and key aspects of our mission from the past year. Please enjoy reading a bit about each one and if you have a moment, vote for the bird that most inspires you to take action to protect the natural home of wildlife and ourselves. When wildfires tore through California causing devastation to people and wildlife alike, Bird Rescue was able to lend a helping hand when a Tundra Swan was found in crisis near ground zero of the Camp Fire. A local resident delivered the bird to a nearby rescue facility who later transferred the swan to our SF-Bay Delta wildlife center where it could recover in our large pools and waterfowl enclosures. Upon arrival the swan was covered with ash, smelled of smoke, and was suffering from red, irritated eyes due to the smoke and fire. Swans are large and unruly patients, so our staff and volunteers had to put in extra time and work to care for this bird. After two weeks at our facility, the Tundra Swan was healthy and ready for release. Our team picked out a location where a flock of migrating swans had recently been sighted and released the swan to continue on its southward journey for the winter. Throughout this summer, Bird Rescue received a large influx of young, hungry Common Murres that had been found stranded along Northern California beaches. Among them was a young murre we named “Mara” after the volunteer who rescued her from the shore. Bird Rescue staff and volunteers were all-hands-on-deck for weeks as we strove to keep up with these hungry and growing birds. We were truly inspired by our community of supporters that came together to help fund the care of all these birds in need. After over a month in our care, Mara and dozens of her fellow murres were released back to the wild. California Brown Pelicans caught the attention of national media when two young pelicans crash landed at a Pepperdine graduation ceremony. This was the beginning of a sudden influx of injured and emaciated Brown Pelicans to our two California wildlife centers. One particular young female pelican quickly stole the hearts of our staff and volunteers alike. She was found in a backyard pond attempting to feed on koi fish. Weighing in at just 2480g (~5.5lbs) on arrival, she was by far the smallest pelican that came into care. When she was finally strong enough to move to an outdoor enclosure, she spent all day standing right next to the American White Pelican in care, further accentuating her small size. On June 13th, after gaining over 1000g (2.2lbs), this beautiful little pelican was released back to the wild, to the delight of media and public spectators. In a Bird Rescue first, this baby Belted Kingfisher was raised from a hatchling to release! Having never cared for such a young kingfisher before, our staff had to constantly learn and innovate in order to provide for this unique patient’s needs. A special “burrow” was created using towels to mimic this little one’s natural nest, and volunteers and staff had to disguise themselves as adult Belted Kingfishers at feeding time to prevent the young kingfisher from becoming attached to humans. All of that work paid off as the baby kingfisher grew up healthy and strong and was released after a month in our care. Found looking bedraggled on a beach in Oregon, this adorable Brown Booby made quite the journey to get to our L.A. wildlife center. Our friends at the Oregon Coast Aquarium flew him down to us via Alaska Airlines where he was picked up at LAX by our Center Manager. Our team was delighted to care for this unique patient as he built up weight and strength. After just a couple of weeks, the booby was in great condition and ready to be released. We are so happy to have partners like the Oregon Coast Aquarium who work with us to get birds like this Brown Booby the care they need in the place where they need it. This young Green Heron exemplifies the good that can happen when just one person takes action. A concerned member of the public found this little heron after it had fallen into a pond. Too young to get out on its own, the bird would have drowned had this gentleman not intervened. He gathered it up and kept the heron safe and warm in proper housing until he was able to bring it to our wildlife center. The little Green Heron was able to grow up alongside several other orphaned herons and egrets and was successfully release back to the wild at the end of September. Every bird that comes into care has a rescuer behind them, and we are so grateful to the individuals who jump into action on behalf of wildlife to get them the help that they need. Thank You For Helping Us Reach Our #GivingTuesday Goal! We reached our Giving Tuesday goal!!! Thank you so much to all of our donors and to Chevron El Segundo and Phillips 66 for their matching gifts. We hit our goal of $30,000 for #GivingTuesday. Your contributions will go a long way toward rescuing waterbirds in crisis over the coming year. Success Story: Rehabilitated Pelican E17’s Eight Year Journey! This story spans eight years and crosses international borders – all wrapped up in the journey of International Bird Rescue’s most famous former patient and parent, a California Brown Pelican banded E17 after his rehabilitation in 2010 at our Los Angeles center. E17 created quite a buzz when he was spotted for the third time last month in Northern California during the semi-annual Brown Pelican count off of the Alameda Reserve Breakwater Island, a collaboration between the U.S. Fish and Wildlife Service and Audubon California. For those of you who may not be familiar with this bird’s story, it began when he was in care with us for 259 days after his flight feathers had been clipped short, bringing likely suspicions of foul play by humans. To get more on his back story see this blog post. Since his release, E17’s story has become even more compelling! As you can see in the timeline below, it is apparent that he is an international traveler, flying between San Jeronimo Island in Mexico, Northern California and likely many points in between. Most notably, he surprised and delighted the rehabilitation community in 2017 when he was photographed fathering two chicks on San Jeronimo Island! Though E17’s rehabilitation story illustrates great success, many pelicans and other seabirds face agonizing injuries and death from cruelty at the hands of humans. Please donate today to help us continue to care for the many patients International Bird Rescue receives every year suffering from pointless cruelty, like E17. 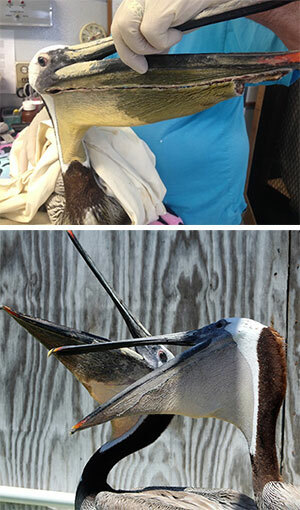 Remember this Brown Pelican with the monstrous pouch injury we posted earlier this summer? We have good news: The bird recovered and was released after major surgery and weeks of specialized care. The original injury to this young Brown Pelican mid-July, 2017. On July 16 2017, a kind-hearted person in Huntington Beach, CA rescued a young Brown Pelican with a horrendous wound. The poor bird’s pouch was completely ripped open, rendering him unable to eat. They brought the starving bird to Wetlands and Wildlife Care Center in Huntington Beach where he was treated for a few days before being transferred to our Los Angeles Wildlife Center in San Pedro, CA. We found that the entire left side of the bird’s pouch was shredded and the loose dangling flaps of tissue were bruised and swollen from the rude and painful interruption to their blood supply. The bird also was found to have two separate problems with its bill—the upper bill was partially fractured longitudinally half way along its length while the left mandible was completely fractured back by the jaw joint. Our staff splinted the fractures and stapled the tissue in place temporarily so the bird could eat while getting stronger before what would be a very long surgery. A few days later, our vet decided the splint was sufficient for the upper bill break but the mandible fracture needed to be pinned. Pelicans have unusual bone texture where the bones have huge interior air spaces and extremely thin but strong outer walls. The outer bone wall is so thin that the threaded orthopedic screws usually used to pin bird bones don’t work. So our vet used something rather akin to an abstract work of art called a “spider fixator” to provide stability. Next, she tackled the long process of suturing the pouch back together. Pelican pouch has very fine stripes that run parallel to the jaw that can tell us how ripped pieces are supposed to fit together. Once all the stripes of the shreds were lined up, it became clear that there were really three long straight parallel cuts with the tissue between the cuts ripped free. This suggests the injury may have been caused by a boat propeller. After the feisty bird had all of his sutures and pins removed, the pelican spent a few weeks in our large flight aviary getting some exercise before we set him free! He is now sporting big blue band “N75,” so keep your eyes out for him flying the coast. Every Pelican matters and we so appreciate the public’s support of our efforts. View inside Brown Pelican’s pouch after removal of pouch repair sutures, with major parts labeled! Check out the new blood vessels he grew to supply the ripped area. Out in the aviary Aug 24, 2017, healing like a champ. We’ve got some exciting news to share! One of the blue-banded Brown Pelicans we released seven years ago was spotted with nestlings in Mexico. This is the first confirmed sighting of one of International Bird Rescue’s rehabilitated pelicans on a nest with offspring. It inspires us with hope and underscores our belief that wildlife rehabilitation efforts can make a difference, especially with a species that was recently delisted from the endangered species list. Though the organization has been banding birds in collaboration with the USGS Bird Banding Lab for most of its 46 years, it only started using these more visible blue bands in 2009, the same year Brown Pelicans were removed from the Federal Endangered Species List. The blue bands have drastically increased the ability to track rehabilitation success with sightings demonstrating normal foraging, migration and now breeding post-release into the wild. To date more than 1,200 pelicans have been banded with these blue bands. 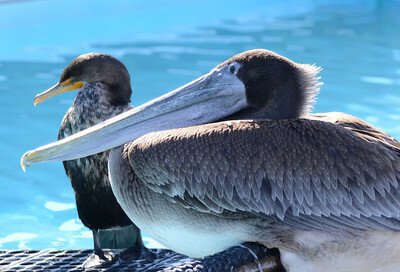 Brown Pelican ‘E17’ was rehabilitated and banded at Bird Rescues Los Angeles Wildlife Center. Julie Skoglund, Operations Manager, recounts that this pelican in particular was an unusual case in which the flight feathers that support the bird’s ability to fly had been clipped short. The pelican was released in October 2010. The photo was captured off the coast of Baja California, Mexico, on San Jeronimo Island by Emmanuel Miramontes, a biologist working with a Mexican nonprofit organization GECI A.C. (Group of Ecology and Conservation of Islands). San Jeronimo is more than 300 miles from E17’s release point in San Pedro, CA. “It’s doubly interesting because this bird is a male, and what Emmanuel has captured is actually a photo of a doting dad,” Bergeron added. In a world where bad news abounds, we’re happy to report this inspiring story. Released in 2012, this Snowy Egret was spotted, photographed and reported this month by Leslie DeFacio. One of the biggest rewards of working in wildlife rehabilitation is seeing treated birds released back to the wild. The one thing better is learning that these patients are now thriving back in nature. This holiday season at International Bird Rescue one particular bird brings us further joy. A Snowy Egret released in 2012 was spotted in the San Francisco Bay Area this month by bird enthusiast Leslie DeFacio of Alameda, CA. She reported the bird as active, wading, walking, pivoting, flying, and overall very healthy looking. This Egret was treated at our San Francisco wildlife rehabilitation center back in May of 2012, after being rescued after falling from the nest at West 9th Street rookery in Santa Rosa, CA. After providing supportive nutritional care and treatment for a minor elbow wound, it was released in June of 2012 at the Martin Luther King Jr. Shoreline Park in Oakland. Before release it was banded with red band number A09. DeFacio submitted an online bird banded report that indicated the Egret was seen at Bay Farm Island, Shoreline Park in Alameda – not far from the release location in 2012. It was seen with 4 – 6 other Snowy Egrets foraging/feeding at sunset along the shoreline of the San Leandro Channel. This Egret has also been spotted and reported multiple times in 2015 – most recently in April 2016 by avid birder Cindy Margulis, Executive Director, of the Golden Gate Audubon Society. Tracking rescued and rehabilitated birds after release provides us with valuable information. Before release we secure ID markers-loose, non-obstructive, plastic and/or metal bands-around one or both legs. These enable us to gather data on returning patients, live sightings, breeding success, travel patterns, and life span. Thanks again to Leslie DeFacio and Cindy Margulis for submitting this important location data on A09. With the public’s help we expect to see more of these success stories in the future. For 44 years, International Bird Rescue has been responding to oiled wildlife emergencies all over the world, and yet 2015 has been a year to remember! On January 16th, we received reports of a large number of water birds on San Francisco Bay contaminated with an unknown sticky substance – including Baxter the Bufflehead duck, shown in these photos before and after his cleaning. Like many of the birds, Baxter was covered in slime, dirt, and rocks, destroying his waterproofing and his ability to maintain his body temperature. All the affected birds required intensive care and we had to develop a whole new cleaning process for this substance. This “Mystery Goo” was not a petroleum product, which meant there was no protocol for who would take responsibility for the birds and how they would be cared for. Putting our own resources on the line, we at International Bird Rescue stepped into that void and accepted more than 300 birds. We then asked you – our dedicated supporters–for help, and you responded with much-appreciated donations! It’s your support that enables us to put in the hard work needed to give these birds a second chance. New research out of New Zealand is helping underscore what we’ve always believed: Saving oiled birds and returning them to the wild healthy and clean is not just well meaning but worth the effort. Researchers from Massey University’s studied Little Blue Penguins (in photo above) following the 2011 Rena oil spill in the Bay of Plenty. They found both rehabilitated and non-rehabilitated birds were behaving similarly – diving to similar depths and in similar locations. They also analyzed the carbon and nitrogen levels in the birds’ feathers and able to show the penguins were feeding on similar prey. Scientists evaluated the foraging behavior of eight cleaned birds using tracking devices and then compared it to the behavior of six unaffected birds. As 2014 comes to a close, our wildlife centers in California have cared for nearly 5,000 patients since January 1. And every bird has a story. Many of the animals we rescue live most of their lives far away from the human-inhabited world. Others are caught up in it (sometimes literally) and face a number of man-made threats to their existence. We do our very best every day to give these animals a second chance — to fly, to find a mate, to perpetuate their species for generations to come. This holiday season, we’re thankful you’ve shared this mission by supporting International Bird Rescue. Challenging as it was, we culled eight of the most memorable patient stories of the year for this holiday newsletter. 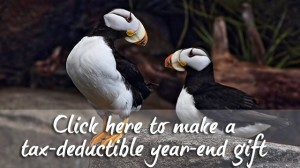 Your year-end, tax-deductible contribution to International Bird Rescue will help ensure this work remains strong in 2015 and beyond. Black Rails are the Greta Garbos of the North American avian world: They just want to be alone. A threatened species in California, they’re experts in hiding among marshland vegetation, and therefore rarely are seen. 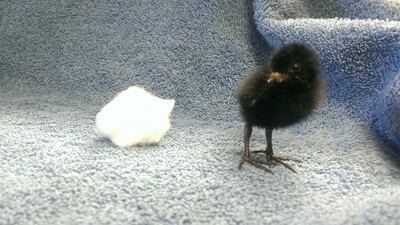 So it came as a surprise that International Bird Rescue’s San Francisco Bay center received several injured Black Rails during the course of the year, as well as our first orphaned baby Black Rail, literally the size of a cottonball. Black Rails are semi-precocial, meaning they are able to feed themselves soon after hatching. That proved to be the case for this chick, which needed feeding for the first few days but then began eating mealworms on its own (click here to view). To help build scientific knowledge of this little-understood animal, we work with the Black Rail Project at the University of California-Berkeley, which banded this bird when it was old enough to be released into marsh habitat. International Bird Rescue’s team of experts is well-equipped to care for sensitive species – endangered, threatened or near threatened. These include the Marbled Murrelet, California Least Tern, Ashy Storm Petrel, Snowy Plover and Piping Plover. One of our longest rehabilitation cases is that of Red #308, a California Brown Pelican who spent well over a year in care for a condition all-too-common to these birds: fishing tackle-related injuries. You can read about this patient in an L.A. Times op-ed here. Brought to our San Francisco Bay center as a hatch-year bird, Red (nicknamed for the color of his temporary leg band) had a horrible wound to his left patagium — a fold of skin on the leading edge of the wing — caused by an embedded fishing hook and monofilament fishing line. Over the course of many months, his injury slowly healed. But Red seemed unable (or uninterested) in flying. So we employed physical therapy and plenty of regular flying workouts, and in time Red was flying from high perch to high perch in the center’s expansive pelican aviary. Releasing Red in November at Ft. Baker, within a stone’s throw of the Golden Gate Bridge, was an emotional milestone, one made possible by staff and volunteers’ tireless work to save a Brown Pelican from an insidious environmental problem. We’re proud to see our work with this species prominently featured in the new documentary Pelican Dreams, now in theaters. An LAX runway. The Mojave Desert. Union Station in downtown Los Angeles. 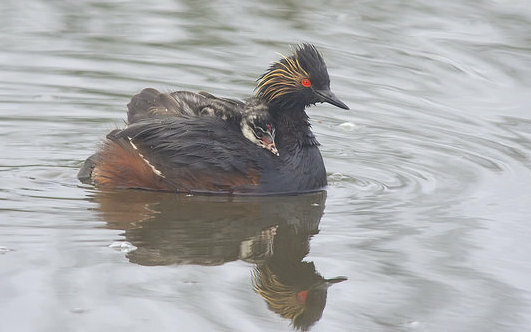 This fall, Southern California residents have seen a large number of crash-landed grebes (pronounced “greebs”) in urban areas and remote locations far from water. This season, our Los Angeles center has cared for well over 100 crash-landed grebes, many of which were symbolically adopted thanks to our friends at The Port of Long Beach as well as devoted International Bird Rescue supporters. This year began and ended with Brown Boobies found far from their established ranges and treated by our animal care professionals. 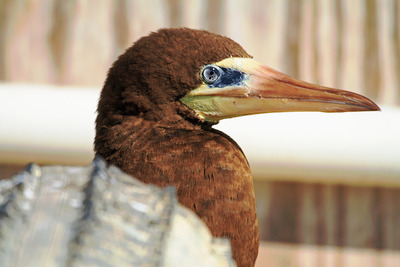 A large seabird that breeds in tropical and subtropical regions such as the Gulf of California, the Brown Booby is an uncommon visitor to the West Coast of the U.S. In January, our San Francisco Bay center cared for a Brown Booby found beached and emaciated at Point Reyes National Seashore. Following rehabilitation, the bird was released off the coast of Los Angeles, much closer to its normal range (you can see video of the release here). Another Brown Booby recently was flown to our L.A. center from Alaska (3,000 miles out of range), where it was found injured on a fishing vessel. This bird remains in care and is no longer limping. We’re very hopeful for an upcoming release! The name “booby” is thought to be derived from the Spanish word bobo, or “stupid,” given the species’ tendency to land on ships where they were easily caught. Historical records show they were sometimes eaten by shipwrecked sailors on vessels including the Bounty. Whatever their intellectual capacities may be, these birds prove to be charming and charismatic patients! For every case ending in an awe-inspiring release, there’s an animal whose injuries were just too much to bear. Some stories are a mix of both. Over the summer, our Los Angeles center team received an adult Elegant Tern and a tern chick hooked together by a multi-hook fishing lure. Our rehabilitation team separated parent from chick and meticulously treated the severe wounds of both animals. 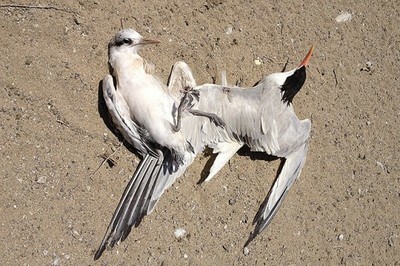 Sadly, the tern’s injuries had already become infected, and this baby bird did not survive. The parent bird healed remarkably after several weeks of care, and was released by our intern and volunteer team at Bolsa Chica Wetlands in Huntington Beach, CA. You can see a video of this bittersweet release here. American Avocets are shorebirds common to the Pacific coast and sport a most-striking upturned bill that the bird uses to “sweep” through the water to catch small invertebrates. In June, an oil spill at a Los Angeles-area refinery caused a small colony of American Avocets to abandon their nests. Thanks to eBird, a citizen science project that tracks bird populations, we identified an American Avocet flock in the Los Angeles River where this young bird was later released. The story of “Pink,” a California Brown Pelican and arguably one of the most famous patients in International Bird Rescue history, is one that begins with the worst of humankind, but ends with the best. In a saga followed by national media, Pink was starving as a result of a deliberate attack in which its pouch was slit completely by an individual or individuals who to this date remain at large. Thankfully, pelicans are resilient animals and respond well to expert veterinary and rehabilitative care. International Bird Rescue’s reputation in caring for pelicans is unmatched the world over. This patient, who wore a pink temporary leg band while at our Los Angeles center (thus the bird’s nickname in the news), was nursed back to health over the course of several weeks. When Pink was strong enough to withstand surgery, our veterinarian sewed his throat pouch back together — a feat requiring two operations and nearly 600 stitches. Pink was released on the sunny afternoon of June 5, leaping from his crate and soaring above the waves as Catalina Island loomed in the distance. It was a new chapter of life for this wild bird, one that symbolizes everything we stand for as an organization. Contributions from the community and donors around the nation made Pink’s care possible. We will always be grateful for the support, and we’ll share any sightings of Pink should he be spotted in the wild. Pink has since traded his pink band for a blue one, reading V70. The alleged details of the crime screamed media circus: This spring, reports began to surface in Oakland, CA, that a landscaping crew hired by the U.S. Postal Service had trimmed trees where Black-crowned Night Herons were actively nesting. 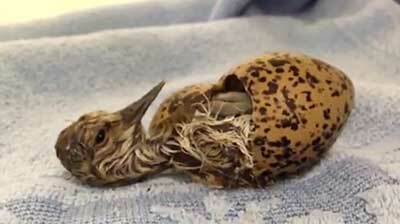 Parents fled, chicks fell to the ground and branches with nests were fed into a woodchipper. A federal investigation concluded that no baby birds had been killed via woodchipper as originally rumored. But many sustained wounds from their fall, and were transported to our San Francisco Bay center, where they were treated for such injuries as broken mandibles. International Bird Rescue stayed above the fray and indignation, however much we sympathized with the outrage that many bird lovers had. Our mission was simple and two-fold: one, to care for as many birds as we could, and two, to educate the public that spring is not the time to be trimming your trees for this very reason. As part of our outreach, we invited the tree-trimmer responsible for the incident to our center for a first-hand look at these heron patients, as well as baby Snowy Egrets (shown below), which also often fall from nests and onto streets and sidewalks. It was a wonderful meeting, one accompanied by unprompted remuneration for the birds’ care by this gentleman. Our San Francisco Bay center, in conjunction with partner wildlife organizations and Audubon chapters, released hundreds of egrets and herons back into the wild during the spring and summer. Some of these releases involved local youth groups like the one you see here. Saving wildlife, educating the public and inspiring young birdwatchers: Is it possible to have more fulfilling work? We think not. We are International Bird Rescue, and we’re so thankful for your support. Taking flight with Richmond youth! With the help of some eager young bird watchers, a group of herons and egrets has a new lease on life! On July 23, we teamed up with the Richmond Police Activities League (or “RPAL”) youth group to set free five Snowy Egrets and three Black-crowned Night Herons at Pt. Pinole Regional Park with a jaw-dropping view of the San Francisco Bay. Snowy Egrets have long been a bird of special interest — they were hunted to near extinction in the early 20th century for their plumes and have rebounded thanks to the grit and determination of conservationists. But prior to this summer, many Bay Area residents may have never heard of a Black-crowned Night Heron – that is, until a May tree-trimming incident in Oakland resulted in several orphaned herons falling from their nests. Local and national media descended on this story as five young patients were brought to our San Francisco Bay center with broken bones and scrapes. All were also too young to survive on their own, and were released in early June after several weeks in care. This year, we’ve raised over 250 young Black-crowned Night Herons and over 130 Snowy Egrets at the San Francisco Bay center — far above our usual levels. 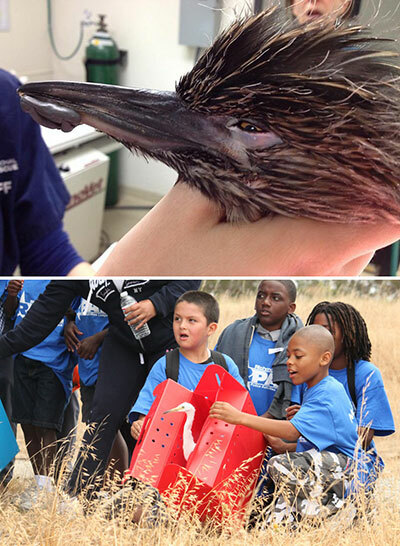 So we were very excited this week to team up with Chevron Richmond and the East Bay Regional Parks District to host a release event with RPAL kids on a field trip to Pt. Pinole. After their carriers were carefully carried and opened by team RPAL, the birds flew up into a nearby eucalyptus tree or to some tall grass nearby for cover. 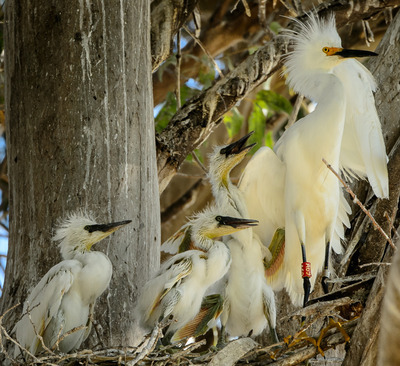 As part of our Snowy Egret project, the egrets released all have red leg bands with a unique identification number. These birds are numbered C44, C45, C46, C47 and C48. If you see these birds in the wild, please report your sighting by emailing us. International Bird Rescue’s team loves to share our passion for animals with local youth. If you are a local youth group in the Los Angeles or San Francisco Bay Area and you’d like more information on a release outing, please email us! Preservation plans for the release site at Breuner Marsh, located within the Point Pinole Regional Shoreline, include restoring wetlands and coastline prairie, as well as providing improved public access to the shoreline and a 1.5-mile extension of the San Francisco Bay Trail. Thanks for being our release pals today, RPAL! We think it’s safe to say that most citizens of the Bay Area now know what a Black-crowned Night Heron is…. The subject of extensive media attention in the New York Times, San Francisco Chronicle, local TV news and NBC’s The Today Show, five baby Black-crowned Night Herons — a federally protected species — were injured in early May after falling from their nests during a tree-trimming incident at a U.S. Post Office location. All herons were brought to WildCare in Marin County for initial treatment before transfer to International Bird Rescue San Francisco Bay center, which specializes in herons and other aquatic species. The injured herons have been treated for injuries sustained from the fall, with one baby heron suffering a fractured mandible that required surgery and healed remarkably. Ernesto Pulido, the proprietor of the tree-trimming business, immediately stepped forward to pay for the care of these animals. Fast-forward to this past Saturday, where we were proud to work with Golden Gate Audubon Society on a release event at Martin Luther King Jr. Shoreline Park in Oakland. Four of the five herons from this incident were successfully released; the fifth is still in care but doing well (a fifth bird ready for release joined the other four at MLK Shoreline’s New Marsh). Thank you to Mr. Pulido as well for stopping by! These are some of the dozens of herons we’ve cared for this season. You can support their ongoing care here. Other good news: Our friends at Golden Gate Audubon have put together a wonderful pamphlet on tree-trimming and baby birds season that you can download here. A Spanish-language version will be released soon. And thank you to all the birders who came out to see our patients off! We were happy to see these young herons start hunting for prey at the marsh within a half hour of release. An elusive bird that hides in thick marsh vegetation, the Black Rail is listed as a near-threatened species (and formally listed as a threatened species by the State of California). This spring, our San Francisco Bay center cared for a baby Black Rail, a victim of cat predation that suffered a broken mandible. Researchers with the Black Rail Project at the University of California-Berkeley banded the bird once its injuries had healed and it was old enough to be released. We’re happy to report this bird was released at Petaluma Marsh, where it was originally found! Pink, a California Brown Pelican and now arguably one of the most famous patients in International Bird Rescue history, was successfully released on Tuesday afternoon at White Point Park in San Pedro, CA, by L.A. City Councilman Joe Buscaino, assisted by a lovely young girl excited to see the bird off on its next adventures. As you may have read, less than seven weeks ago this animal was brought to our Los Angeles center with its throat pouch nearly severed off its bill. A human-caused injury, the incident sparked outrage among animal lovers in Southern California and beyond. A $20,000 reward is still being offered for information leading to the arrest and conviction of those responsible for this illegal act. Tips may be made anonymous to US Fish and Wildlife Service at 310-328-1516. Thank you to everyone who helped support the care of this bird, including the Port of Long Beach, the Animal Legal Defense Fund, the Ian Somerhalder Foundation, Terranea Resort and countless bird lovers in Los Angeles and elsewhere in the country. After two surgeries and weeks in care, this pelican made a record recovery and was very eager for release from our large pelican aviary. As part of our Blue-Banded Pelican Program, we banded Pink with a blue band reading V70. If you see Pink out along the Pacific Coast, you can report your sighting here. Releases are always powerful experiences that cut through the madness of modern life. International Bird Rescue’s “Every Bird Matters” mantra was definitely the theme of the day. Photographer Bill Steinkamp was on hand to take some wonderful photos of the event. Enjoy! When: Tuesday, June 3 at 12:30 P.M.
Where: White Point Park in San Pedro CA. Address: Kay Fiorentino Drive, San Pedro, CA 90731 (see map below). Nicknamed for the color of the bird’s temporary leg band worn while in care at IBR, Pink was found with a mutilated pouch over six weeks ago by Long Beach Animal Control officers. Unable to feed, the bird was extremely thin, anemic and could not fly when brought to IBR. During the past year, pelican pouch slashings perpetrated by humans have been seen in California, Florida and North Carolina. Pink’s pouch laceration required hundreds of stitches during two operations lasting a total of six hours. IBR is extremely grateful for support from the Port of Long Beach for Pink, whose care was also aided by donations from the Ian Somerhalder Foundation, Terranea Resort and bird lovers in Southern California and beyond. The Animal Legal Defense Fund assisted IBR with communicating this animal cruelty story to the public. Pink’s recovery was made possible by IBR animal care staff, who performed regular exams on the bird and provided extensive rehabilitative and supportive care.